A debate — by state! What’s the reddest bird in North America? In the East, the Scarlet Tanager or maybe the Summer Tanager. But neither is seen nearly as often as the Northern Cardinal. 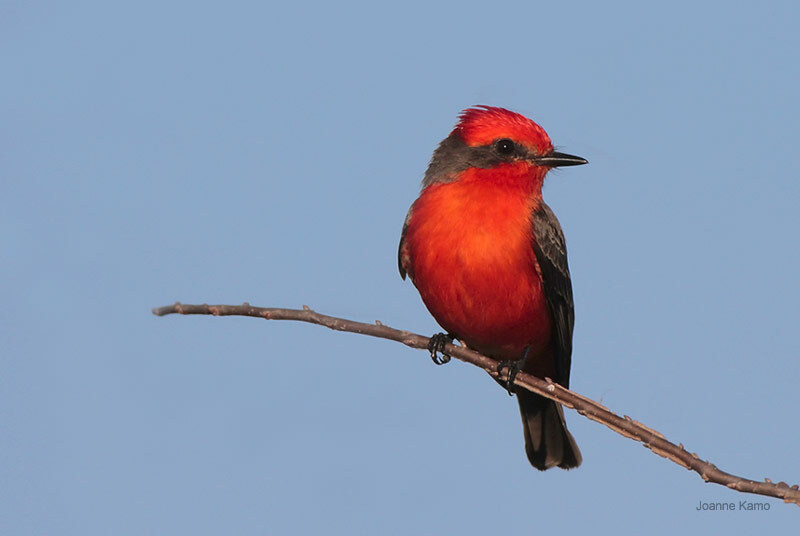 In the Southwest, another candidate pops out like a bright red flare on the tip of a branch: the Vermilion Flycatcher. This dashing flycatcher evokes sparkling names, from the arid Southwest to South America: Mosquero Cardinal — or “cardinal-colored fly-killer” — and Brasita de Fuego or “little red-hot coal of fire.” Be sure to watch this amazing video. What’s the reddest bird on the continent? In the East, the velvety red Scarlet Tanager is a favorite. Maybe the Summer Tanager. Though neither is seen in the open nearly as often as the respectably red Northern Cardinal. [Northern Cardinal song, http://macaulaylibrary.org/audio/130905, 0.07-.09] But in the Southwest, another candidate pops out like a bright red flare on the tip of a branch: the Vermilion Flycatcher. Compared to shy Scarlet Tanagers and skulky cardinals, a Vermilion Flycatcher is a true showman. The male dashes out to capture butterflies and bees, then perches right at eye-level on an open branch. To sing its best to females and rival males, it hovers – butterfly-like – 50 feet in the air, a fluttering beacon of crimson. The dashing Vermilion Flycatcher evokes sparkling names wherever it’s found, from the arid Southwest to South America: Mosquero Cardinal – or “cardinal-colored fly-killer” – and Brasita de Fuego or “little red-hot coal of fire”. Even its scientific name, a title bestowed by sober museum experts, bows to its flash: Pyrocephalus rubinus [py-ro-SEPH-uh-lus roo-BEEN-us] – the ruby firehead. You’ll find an amazing video of a pair of nesting Vermilion Flycatchers, when you come to our website, BirdNote.org. I’m Mary McCann.